Lowe’s stores are trying well to use the AR technology for a better in-store experience for their customers. They have an In-store Navigation app which helps the consumer through the store. The consumer makes a list on the app and is then guided through the quickest routes in the store to grab all the items from the list. AR-powered mirrors are another way of engaging customers while also helping them decide what to buy. Several retail brands like Uniqlo, Timberland, Topshop Rebecca Minkoff have AR-powered mirrors instead of try rooms. The consumer stands in front of them and see a virtual image of themselves. They then can try out clothes to make a choice of which one to buy. American Apparel goes a little more detailed with the in-store game. A customer can scan their products after which they are shown product details as well as customer reviews for a better and informed decision. Walmart has added a lot of excitement quite a few times byjoining campaigns with major movies including Justice League and Teenage MutantNinja Turtle television series. They have printed AR incorporated flyers, and added interactive elements in their store for the consumers. Majority of brands focus on increasing customer engagement which is an automatic increase in sales. 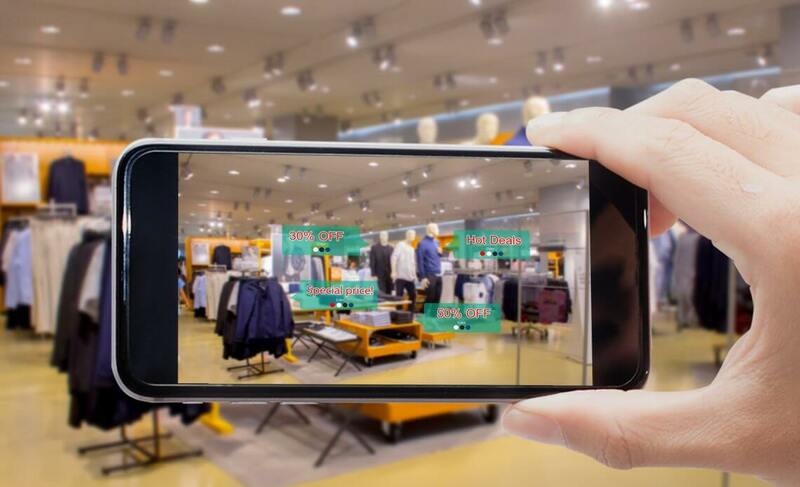 Every retail brand is trying to get in the game and incorporate AR to give the customers the best innovative experience as they shop away.